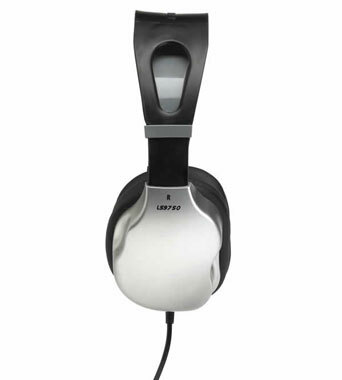 The LS9750 stereo headphone is a cross between the classic “old-school” computer/language lab model and the new consumer and gaming headphone style. This stylish, comfortable, rugged, and versatile headphone is made with ABS plastic and simply won’t wear out or break easily. The high quality 45mm drivers are acoustically balanced within the ear cup chambers to reproduce a clear sound stage. Maximum sound isolation over ear design for concentration. The new Dura-Tuff™ cord is a braided nylon cord that is jacketed with a clear plastic sleeve to insure maximum durability and strongly resist chewing and kink damage. Reinforced entry points at ear cup and plug will resist stress separation and damage. Rugged versatile headphones made with ABS plastic. 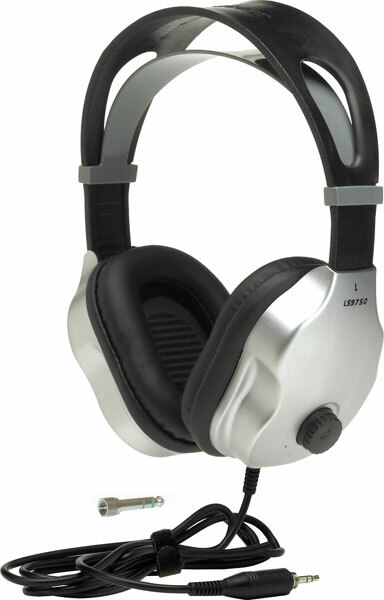 The large thick vinyl ear pads offer durability plus ambient noise protection. They will last for the life of the headphone. The high quality 45mm drivers provide clear sound and are protected by slotted covers that prevent children from damaging them. Sturdy, single-piece headband fully adjustable for students from Pre-K to 12th grade. Volume control on the ear cup.